← What Do Preschoolers Learn from Fantastical Picture Books? If you’re a certified diver, here’s your next science travel destination: an underwater lab converted into a hotel. Jules’ Undersea Lodge in Key Largo, Florida is a hotel that exists entirely under water, and is only accessible by diving down and entering from the bottom. The structure was brought to Key Largo in 1986, but it originally functioned as a research laboratory, La Chalupa. 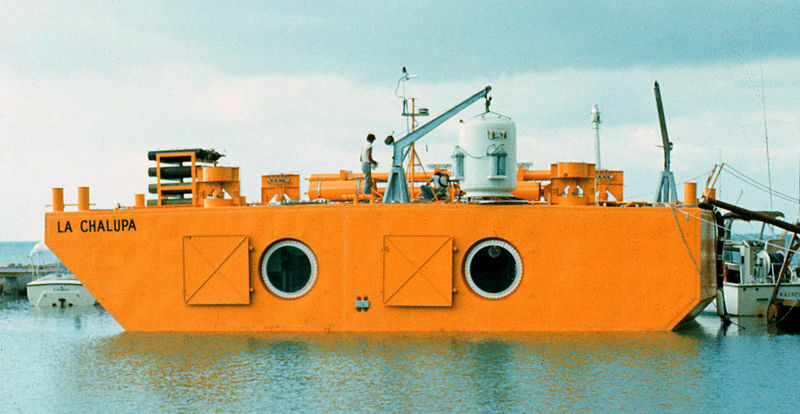 In the 1970s, La Chalupa was used to study ocean research and diving technology off the coast of Puerto Rico. Although La Chalupa is no longer an active research lab in its current location, it does have a lab right next door: the world’s longest continually operated underwater research facility, MarineLab Undersea Laboratory, is in the same lagoon as the undersea lodge. Both the lodge and the lab are managed by the Marine Resources Development Foundation. MarineLab runs several education programmes for students and teachers. Among other projects, the undersea lab has also been used by NASA to study how to maintain a controlled life support system. So if you want to find out what it would be like to live in a space colony, this is the closest approximation on earth, and – despite requiring diving skills – slightly easier to reach. Images: inside of lodge via Lee Turner on Flickr. La Chalupa from Wikimedia Commons. This entry was posted in Have Science Will Travel and tagged diving. Bookmark the permalink.